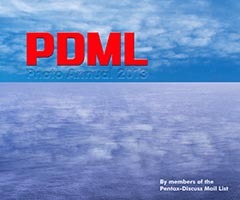 The Pentax Discuss Mailing List, or PDML, of which I'm a "member" (as much as one can be a member of an anarchy) produces an annual collection of photos and humour. This is the 2013 edition, and it's the best yet. By ordering one for yourself and even some for your friends and family you'll be contributing to a great cause (childhood cancer research) but also spreading joy by way of shots from some very talented photographers. So follow the links to the Blurb ordering page and go for it!